Download "State Government Subsidies for Retirement Plans Sponsored by Local Governments. National Conference of State Legislatures, January 2010"
1 Government Subsidies for Retirement Plans Sponsored by Local Governments National Conference of State Legislatures, January 2010 In many states, city and county governments, independent school districts, and other governments maintain retirement plans that are legally and functionally independent of the statewide plans for public employees, teachers and other state and local government employees. The most recent comprehensive report on local government retirement plans is the Bureau of the Census report, 2002 Census of Governments: Employee Retirement Systems of State and Local Governments. It provides a state-by-state count of statewide plans and local government plans, and lists the larger state and local plans in each state along with statistical data. Most states have relatively few locally-sponsored plans; Hawaii, Maine and Montana have none. A few states have more than 100 local plans. Illinois is reported as having 365, and Pennsylvania as having 928, as of This report is concerned with state government financial subsidies for local government plans. 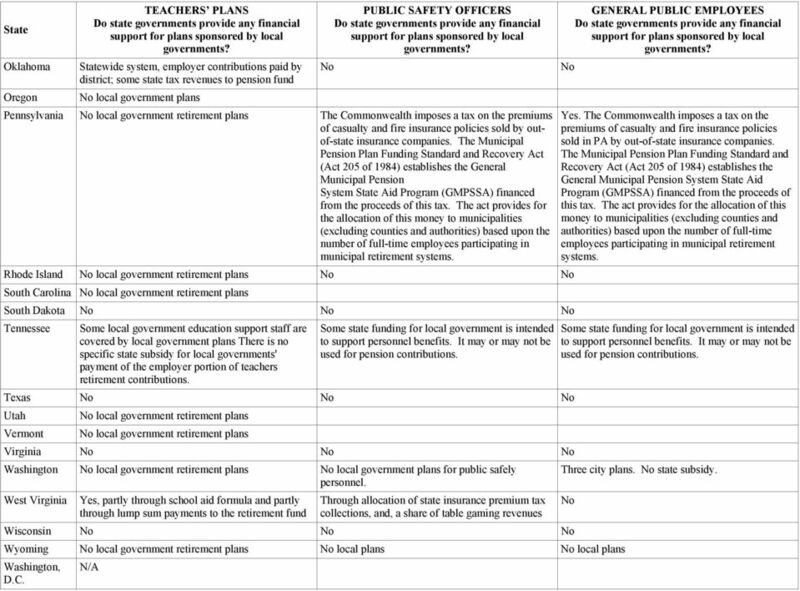 It is not concerned with statewide plans that include employees of local governments, but only plans that are sponsored by a local government for employees of that government. The information in this report was collected by staff of the National Conference of State Legislatures from March 2007 through January Contact information: Ron Snell National Conference of State Legislatures, Denver, Colorado State Alabama Alaska local government plans Statewide system Arizona local government plans Arizona subsidizes, within the Public Safety Personnel Retirement System, the Dept. 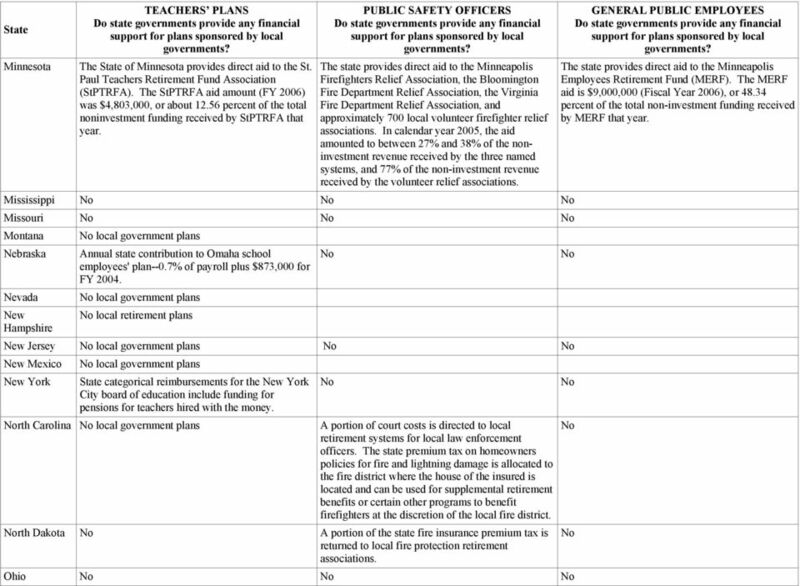 of Public Safety member rates due to a pay raise offset agreement in FY 03. Within the Elected Officials Retirement Plan, state and county organizations are subsidized through court fees. Arkansas local government plans Statewide system Yes, in an inadvertent way (i.e. not by specific appropriation). The normal cost for state employees is about 10%, while that of city and county employees is 14.5% and 13.6% respectively. However, all employers pay 12.54%; therefore the inadvertent subsidy. 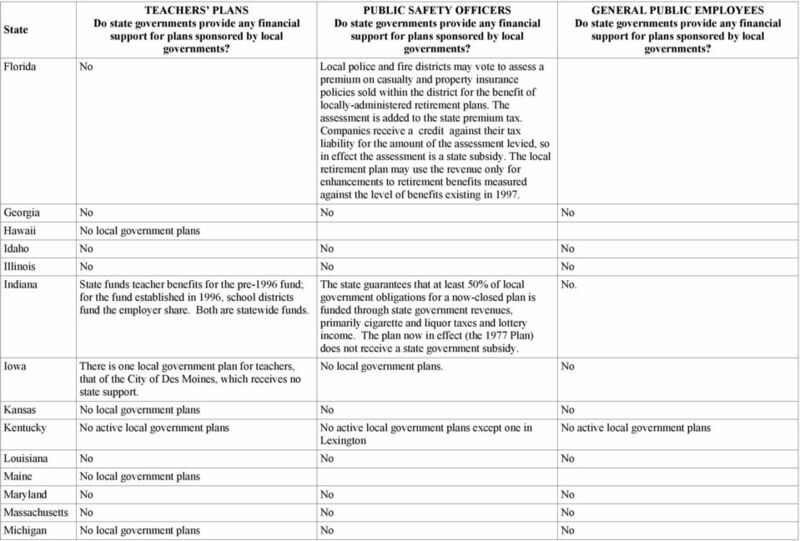 California local teachers' plans. 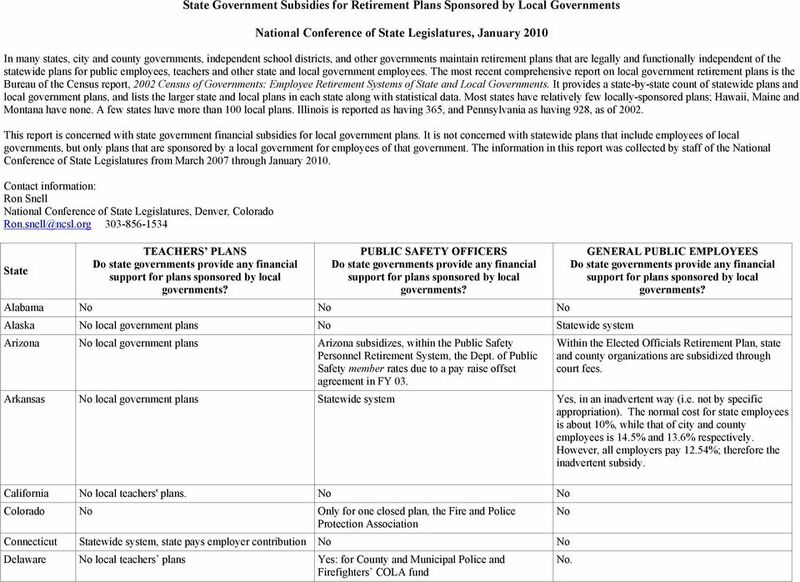 Colorado Only for one closed plan, the Fire and Police Protection Association Connecticut Statewide system, state pays employer contribution Delaware local teachers plans Yes: for County and Municipal Police and Firefighters COLA fund. 3 Minnesota The State of Minnesota provides direct aid to the St. Paul Teachers Retirement Fund Association (StPTRFA). The StPTRFA aid amount (FY 2006) was $4,803,000, or about percent of the total noninvestment funding received by StPTRFA that year. The state provides direct aid to the Minneapolis Firefighters Relief Association, the Bloomington Fire Department Relief Association, the Virginia Fire Department Relief Association, and approximately 700 local volunteer firefighter relief associations. In calendar year 2005, the aid amounted to between 27% and 38% of the noninvestment revenue received by the three named systems, and 77% of the non-investment revenue received by the volunteer relief associations. Mississippi Missouri Montana local government plans Nebraska Annual state contribution to Omaha school employees' plan--0.7% of payroll plus $873,000 for FY Nevada local government plans New Hampshire local retirement plans New Jersey local government plans New Mexico local government plans New York State categorical reimbursements for the New York City board of education include funding for pensions for teachers hired with the money. rth Carolina local government plans A portion of court costs is directed to local retirement systems for local law enforcement officers. The state premium tax on homeowners policies for fire and lightning damage is allocated to the fire district where the house of the insured is located and can be used for supplemental retirement benefits or certain other programs to benefit firefighters at the discretion of the local fire district. rth Dakota A portion of the state fire insurance premium tax is returned to local fire protection retirement associations. Ohio The state provides direct aid to the Minneapolis Employees Retirement Fund (MERF). The MERF aid is $9,000,000 (Fiscal Year 2006), or percent of the total non-investment funding received by MERF that year.